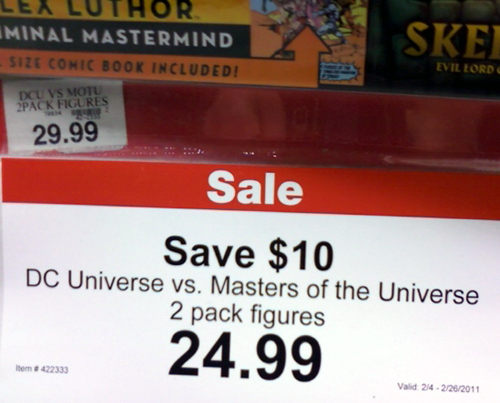 If you have held off on picking up the Toys "R" Us exclusive DC Universe vs. MOTU sets until now, your patience has been rewarded. Through the end of February, the two-packs are $10 cheaper than normal. Don't let that $24.99 price fool you. The "Save $10" text is the important part of the sign. If you notice above the sale sign, the shelf tag for the two-packs clearly reads "29.99". The sale is good for $10 off the normal price, so these sets should ring up at $19.99. If you're worried about running into a problem at the register, scan the set under the price checker before going pay. There are currently four two-packs available. The first series includes He-Man/Superman and Skeletor/Lex Luthor. The newest set includes Merman(blue)/Aquaman and Stratos/Hawkman. If you haven't seen those new sets yet, keep an eye out. 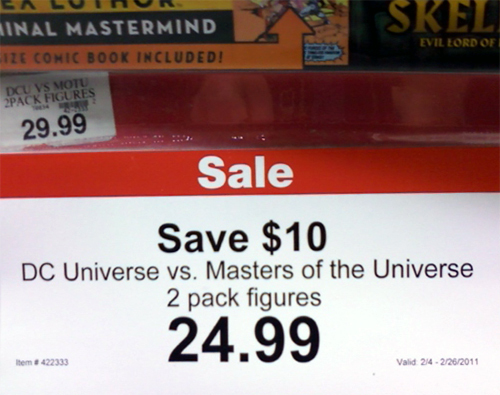 This sale should do well to clear out lingering Luthors to make way for the newer sets.